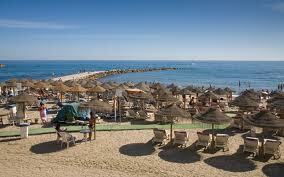 Located on Spain’s southern sunny coast is the well-known Costa del Sol. With miles of sandy beaches and beautiful blue waters, the Costa del Sol is one of Spain’s most popular and most visited destinations. Perfect for family holidays as well as golfing holidays and partying holidays for the younger crowd, the Costa del Sol attracts visitors in their droves all year round. The main international airport in the Costa del Sol is located in Malaga. There are many airlines operating direct flights from the UK to the Costa del Sol, Spain such as British Airways, Monarch and Flybe. For low cost flights, try easyJet and Ryanair as well as charter operators. Stretching from Almeria to Tarifa, this densely populated part of Andalusia is particularly popular with northern Europeans looking for some guaranteed sun. As well as the packed resort of Torremolinos, the Costa del Sol also boasts the upmarket resort of Puerto Banus and the town of Marbella, famous for its buzzy nightlife as well as its old medieval town. The city of Malaga, birthplace of Pablo Picasso has many cultural attractions including the Picasso Museum, Moorish fortresses and some superb art galleries. Directflights.com is the fastest growing travel comparison site, try our flight search box to find the cheapest flights to Costa del Sol, Spain as well as thousands of destinations across the world. Look out for special offers and try to book in advance for the best deals on cheap flights, we can also assist you in finding competitive fares on lastminute flights. The Costa del Sol weather is exactly what you would expect from the name "Sunny Coast", sun, sun and more sun. It is one of the best, most reliable and healthiest climates in the world with more than 300 days of sunshine per year. In the winter months the climate is temperate with average daytime temperatures of about 16ºC. There can be some rainy days during this period but when tends to vary from year to year and it seldom lasts more than a few days.